The vehicles known as Tuk-Tuk originated in Japan by Daihatsu and it was Thailand who subsequently went into production with these vehicles many years later. Thailand built Tuk-Tuks cost between 95'000 Baht and 150'000 Baht. As far as we know, there are about five to six manufacturers of Tuk-Tuks in Thailand. The original Thai Tuk-Tuk is found in many places in Thailand, mostly operating as an open air taxi. 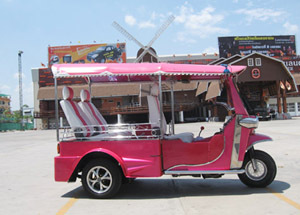 Named for the sound made by their small-capacity, two-cycle engines, tuk-tuks are often found in tourist areas, around markets, or cruising the streets for fares. It is common to see 4 or 5 people in one tuk-tuk, such as students heading home from school, or a single person riding a Tuk-Tuk full of boxes and bags being taken home from the market. Visitors to Thailand are usually very interested and curious about the Tuk-Tuk, a locally made and designed three-wheeled vehicle. Tourists are often seen getting their picture taken with the open-air vehicle, and heard swapping tales of their experiences with the charming little machine. as current models, powered by a 550 CC Japanese made engine, are able to carry a payload of 1000 kilograms. Customers have used Tuk-Tuks for hauling goods in factories, distributing goods and products in regions that have extremely narrow roads, and transporting guests around resort properties.